Makerspaces are places where people can make, invent, and learn. They are creative, “do it yourself” spaces providing tools and equipment. 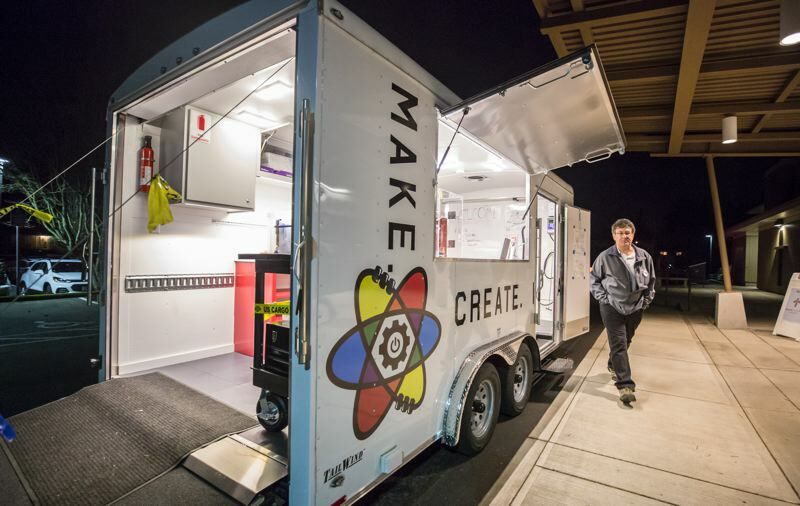 The Tualatin Mobile Makerspace will provide hands-on learning experiences for youth, to spark an interest in STEAM (science, technology, engineering, arts, math) subjects. This project is funded by the Tualatin America’s Best Communities Initiative and is supported by community partners, including the Tualatin Chamber of Commerce, City of Tualatin, Mask & Mirror Community Theater, Tualatin Public Library, and the Tigard-Tualatin School District. Construction has completed on our Tualatin Mobile Makerspace unit! You can read all about it in these articles in Tigard-Tualatin Times and Tualatin Life.